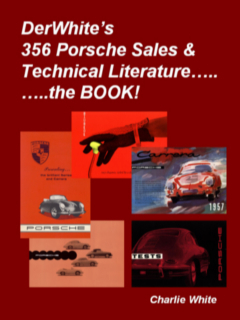 See the results of actual sales of 356 Porsche Sales and Technical Literature! The following 35 items were sold on Live Auction Ebay by AutoTechnikAuktion, Germany. bidder also pays a 22% BUYERS FEE, and a 3.8% VAT TAX, that's an additional 25.8% added!! $20,324.00US! Yes, that's Twenty Thousand.......................Dollars US! anything cooler than this! (M&M N/A). published by Porsche during the 356 era. (M&M N/A). become highly collectable. (M&M N/A). 356 Porsche steering wheel. (M&M N/A). what it is worth! (M&M N/A). a commonly available brochure for the 356-B T-6. (M&M 215). GS. However, anything 356 Carrera is hot! (M&M N/A). 4/25/08: This "1955 Porsche 550 1500 RS Spyder Owner's Manual"
sold on Ebay for $3,596.00US! That's correct: THREE GRAND+++! a good look a the correct color in this image! (M&M N/A). Connecticut, and not by Porsche. (M&M 209). 4/25/08: This "Carrera 2" Brochure" sold on Ebay for $235.00US. increasing rapidly in value. (M&M 233). 4/25/08: This "Sebring 1957 Poster" sold on Ebay for $1407.00US! 4/25/08: These two "356 Carrera 1500 & 1600 GS Owner's Manuals"
rare and collectable. (M&M N/A). $156.00US! This brochure was published in 1962 for the 356-B T-6. 356-B with a black VW behind it. Highly collectable! (M&M 214). "Convertible" on the inside, and the other mentions "Convertible D". and they are hard to tell from originals! (M&M N/A). technical specifications for the 1955 models. to find. Prices are rising on all Porsche-Ulmer ceramic items. due to the fact that there just aren't very many of these around! There aren't many of these cars around either! (M&M N/A). 4/25/08: This "Mixed Lot of 356 Porsche Color Charts & Price Lists"
about right on if the items were valued individually. (M&M Various). a result, surprise, the prices have been going UP! (M&M N/A). showing a split-window Pre-A Cabriolet is amazing! (M&M N/A). Porsche and lots of color. No wonder it brought a high price! 1962 and end with 1973. (M&M N/A). 1954. There is another version of this brochure with a green cover. nice condition are bringing increasingly higher prices. (M&M 65). as it has to this price. (M&M 239). 4/25/08: This "Porsche of the Welt Poster" sold on Ebay for $907.00! 4/25/08: This premium slick-covered all color "Racy Elegence"
includes the Speedster and the other includes the Convertible D! This one included the Speedster. (M&M 131). difficult brochure to find which sold on Ebay for $406.00US! one side with technical specifications for the B Carrera 2000 GS. END of Live Auction Ebay by AutoTechnikAuktion, Germany. 356-A 1956 to 1958. Changes in 1959 are covered in a supplement. a low price in the range of recent sales. See previous Sales below. high demand resulting in the escalating prices. (M&M N/A). by Porsche for the first 356 equiped with disc brakes. (M&M 273). about what 356's sold for back then. (M&M N/A). collectable and are increasing rapidly in value. (M&M 233). for auction very often. (M&M N/A). are other versions of this manual with a red/black graphic cover. 356, 356-A and 356-B Porsches. (M&M N/A). $212.00US! This is the highest price I've seen this brochure sell for. brochures, in part accounting for the rising prices. (M&M 65). a fairly high price, in the range of recent prices paid. (M&M 127). year were made. (M&M N/A). not as common as sales brochures and are relatively hard to find. Hence the big price for a tiny item. Highly collectable! (M&M 304). was published as a supplement to the 356-B Owner's Manual. to see what all in the way of accessories was offered back then! of car bodies, i.e. paint, etc. Nice item. (M&M N/A). and C. A later factory reprint has a different cover. (M&M N/A). this item with different print dates. (M&M 172). many of these supplements, hence the high and increasing prices! English version. They only cover the Carrera engines. (M&M N/A). this manual. The supplement covers changes for 356-A's for 1959.
out there and they are hard to tell from originals! (M&M N/A). and prices continue to escalate. (M&M N/A). of rough lower quality paper or slick high quality paper. (M&M N/A). 2/18/08: This "356-B Factory Workshop Manual & Supplement Set"
manuals are popular with 356 owners & collectors. (M&M N/A). 2/11/08: This premium slick-covered all color "Racy Elegence"
for in excess of $1,200.00. (M&M 75). 2/8/08: This "356-B Factory Workshop Manual & Supplement Set"
parts house Stoddard. Finding an original factory version is difficult. was a German language version. (M&M 251). price range! This one was a German language version. (M&M 273). for an early non-Porsche brochure! (M&M N/A). original factory version is difficult, hence the high price (M&M N/A). the 356-A Owner's Manual. (M&M N/A). old book about 356 Porsches for the avid collector! (M&M N/A). them easy to mistake for originals. (M&M N/A). 1/21/08: This premium slick-covered all color "Racy Elegence"
for this year Christo calendar. The first one was published for 1956.
become very collectable. (M&M N/A). seen paid for a 1960 Christo calendar. (M&M N/A). 1/19/08: This "356-A Factory Workshop Manual Supplements Set"
was printed with a blue tool-graphics on the cover. (M&M N/A). bring high prices from collectors at auction. (M&M N/A). make items associated with it highly collectable. (M&M N/A). still sells for a good price. A nice early Pre-A brochure. (M&M 23). brings this kind of price? What next? No accounting for collectors! It's not even Friday the 13th or April fool's day! (M&M N/A). good shape, with fold lines and wear marks. (M&M 62). has the clear spiral binding, and is probably a recent factory reprint. for around $80.00. (M&M N/A). owner's manuals are in demand and are bringing high prices. 1/01/07: This "356-B 1600 GS/GT Owner's Manual Supplement"
regular 356-B Owner's Manual for cars with the 1600 4-cam motor. These are scarce, hard to find, and expensive when you find one! any cheaper, and this one is one of the most collectable! (M&M 11). victories for Porsche. (M&M N/A). for $735.00US! It was described as a rare French language version. French, German and Italian. There may be other versions. Porsche posters sell for big bucks......but watch out for the repros! what you're buying! (M&M N/A). about the going price in this market! (M&M 127). 24 page booklet and it is believed to have been published in 1956. 1500 RS Spyders. It sold on Ebay for $220.00US. (M&M 102). very nice reproduction is currently in circulation. Go figure! All of the above German Christophorus Magazines sold on Ebay on 12/9/07! bringing higher prices each time it comes up for auction. (M&M N/A). on Ebay auctions as originals. (M&M N/A). being sold on Ebay as originals. (M&M N/A). and had a dealer stamp on the cover. (M&M 75). in English, French, & German. (M&M 88). a split-window coupe on the cover. (M&M 300). expensive at auction! (M&M 85). from a similar item which sold several months ago. (M&M 88). very nice set! (M&M 62). many of these were printed so they are hard to find. (M&M N/A). sell for high prices due to high demand. (M&M N/A). less than one sold about two weeks ago. (M&M 311). on Ebay for $931.00US! This is the highest price I've seen for a "B"
information. Looks just like book sold on 11/10/07 for $176.00US! sales and technical literature. (M&M 251). of recent reproductions which are being sold on Ebay as originals! If they look TOO NICE, they're probably repros! (M&M N/A). world wide!" TWENTY NINE GRAND PLUS.......!!!!! (M&M N/A). on Ebay for $7,332.00US! It is signed by F. Porsche. (M&M N/A). association with Porsche. Sold for $660.00US! (M&M 181). price for the Buyer in this market! (M&M 127). price? Go figure! (M&M N/A). the ONE to get to go with your car! (M&M 75). are going through the roof! (M&M N/A). shown in the M&M book. highly collectable and are increasing rapidly in value. (M&M 233). $440.00US! This is a tough item to find and the price reflects this. 356 Porsche at the factory. (M&M N/A). the earliest Porsche sales brochures, sold on Ebay for $484.00US. increasing in price. (M&M 311). on the Cover" from the early 60's sold for $411.00US on Ebay. sold some weeks ago for $540.00. (M&M N/A). is highly collectable and will bring a high price. (M&M N/A). Volkswagen Canada in 1958 and sold on Ebay for $367.00US! several weeks ago for $670.00US. (M&M 306). is in high demand and will bring high prices. (M&M N/A). nicest 356-C brochure published by Porsche. (M&M 273). also available with a light blue cover. (M&M N/A). the importance of this auction, they're most likely real! (M&M N/A). often. The early ones during the 356 era are the most collectable. The sale price for this example is unusually high. (M&M N/A). on Ebay for $176.00US! This price is quite high for this brochure. to climb as it has to this price. (M&M 239). a nice brochure to have in your collection. (M&M 81). 11/10/07: This "1961 Porsche 356-B Factory Owner's Manual"
there, so know what you're buying! (M&M N/A). versions of these Carrera supplements, all highly sought after. They cover only the 4-Cam Carrera Engine. (M&M N/A). Porsche's 1962 racing victories and sold on Ebay for $205.00US! 11/10/07: This premium slick-covered all color "Racy Elegence"
Ebay auction in August. (M&M N/A). German language versions. Christos are highly collectable, particularly early issues! if you have a 356-C (M&M 257). very nice reproduction is currently in circulation. (M&M 73). is probably the rarer of the two! (M&M 281 for the 1964 version). and like other Porsche literature, prices are rising! (M&M N/A). available for 1957. (M&M N/A). $111.00US! The price is half what a similar one sold for on 7/8/07. Factory Price Lists. (M&M N/A). during the 1950's. Low quality paper, quite collectable (M&M N/A). covered later editions were published. (M&M N/A). 1500 RS Spyders. It sold on Ebay for $159.00US. (M&M 102). English. A must have if you own the car! (M&M N/A). vinyl binders rather than maroon. (M&M N/A). bringing high prices for Sellers! (M&M N/A). supplements for the 356-B T-6 & 356-C. $306.00US! 356-A's, 356-A 1500 GS Carreras, and 550 1500 RS Spyders. appeared to be in excellent condition and brought a high price! the fact that it is a French language version. (M&M 56). earlier this year, maybe due to it being a French language version. but this price doesn't show it. (M&M 60). the brochure being a French language version. (M&M 62). high price of $238.00US! It was described as in perfect condition. OR recent reproductions, which have nearly clear spiral binding. and harder to find. (M&M 308). 9/23/07: This "1959 Werbeartikel (Advertising Items) Brochure"
sold on Ebay for $227.00US! I've never seen this version before. advertising articles (cigarette lighters, ashtrays, key fobs, etc). Price reflects the rarity (M&M N/A). hard to find! (M&M 141). Descriptions in three languages: English, French & German! popular with collectors and are increasing rapidly in price. 9/14/07: This early 356 Pre-A "Prestige, Power and Perfection"
difficult to find. (M&M 47). are the hardest to find because fewer were printed. (M&M 58). bargain price in comparison! (M&M 281). or a listing put together by someone else. (M&M N/A). decent condition and would be a gerat addition to any collection! in the French language is hard to find! (M&M N/A). price! These very early brochures are not getting any cheaper! And this one is the nicest of the very early ones! (M&M 11). quite high for this manual in this condition. (M&M N/A). 8/26/07: This "356-B S-90 Factory Owner's Manual Supplement"
are hard to find because fewer S-90 engines were manufactured. And like all 356 "Paper", prices are going up! (M&M N/A). 8/26/07: This "356, 356-A, 356-B Porsche factory Service Book"
scheduled service. This particular service book is dated 12/59. things 356 Porsche. (M&M N/A). WON'T BE SORRY! (M&M N/A). very collectable, and prices are rising! (M&M N/A). collectable and appears in the M&M Book as (M&M #310). being sold on Ebay as originals! (M&M N/A). $250.00US on 1/7/07. (M&M N/A). one came with the original paper cover. (M&M N/A). magazine started with the equivalent of German #18. "Christo"
mags are higly collectable and are increasing in value. (M&M N/A). 7/28/07: This "1957 Porsche Factory Christophorus Calendar"
like anything else 356, prices are rising! (M&M N/A). your car. Things are getting crazy out there! (M&M 75). for Cabriolets as an option. (M&M N/A). the German #18 Christo, they are the same except for language. Christos are highly collectable & increasing in value. (M&M N/A). 356-B T-5 parts book as the "C" supplement covers only the "C"
and was a bargain at this price! (M&M 301). 7/22/07: This "September 57 Porsche 356-A Accessory Catalog"
low! Inside are descriptions & photos of the available accessories. scenes featuring 356 Porsches. These are highly collectable! doubt stirred up some conversation. (M&M N/A). considerably lower than the prior sale on 7/7/07. (M&M 11). Workshop Manual", in pretty nice condition, sold for $345.00US. shows the high value of non M&M items (M&M N/A). Porsche. There are several versions of this flyer. (M&M 237). price list is almost the same as the one from 1953. (M&M N/A). All of the above German Christophorus Magazines sold on Ebay on 7/8/07! All the 7/7/07 Sales by same Seller, a Very Lucky Day for him! is selling a variety of interesting early Porsche brochures. hard to find in really nice condition! for the 356-B T-6 Carrera 2, & one for the 356-C Carrera 2.
lists and accessory folders are becoming highly collectable! the cover. Sold for the high price of $260.00US. (M&M 215). parts manual for only those parts new to the Convertible D.
for $148.00US, a pretty good price considering current trends! 1959 only. Hard item to find. (M&M N/A). price list for Hoffman Porsche Car Company of New York. list shows prices for various models. (M&M #85). 6/24/07: "Driving in its Finest Form" is a small 3 3/4" x 6"
Ebay for $314.00US. (M&M 102). $290.00US on Ebay. It is a very nice item and hard to find. Very hard to find, sold on Ebay for $364.00US! (M&M294). on Ebay for $510.00US! (M&M N/A). Click Here for Page 3!